The Kimpton Hotel Palomar Chicago; a luxury lifestyle hotel in downtown Chicago central to the citys most exciting shops culture and nightlife. We are surrounded by enticements and make our own distinct impression. You see it in our artful design apparent the moment you walk through our sleek marble entranceway into our living room lobby swathed in rich gold and red. 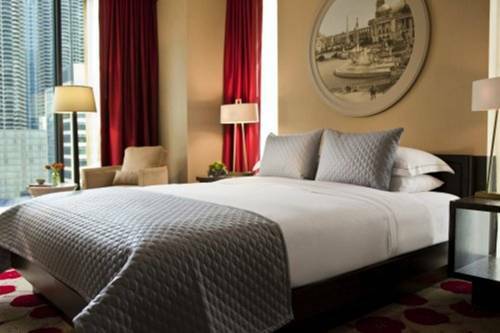 You feel it in our spacious guestrooms where you can carve out quiet time in the company of original art inspired by the Chicago Worlds Fair. You taste it at our adjacent restaurant Sable Kitchen And Bar where our award winning chef elevates New American food to a tantalizing new place. Contemporary: Distinctive catering for our Chicago meeting rooms is provided by our adjacent restaurant, featuring a tailored menu of mouthwatering contemporary American cuisine. Exhibition: Distinctive catering for our Chicago meeting rooms is provided by our adjacent restaurant, featuring a tailored menu of mouthwatering contemporary American cuisine. Abstract Boardroom: Distinctive catering for our Chicago meeting rooms is provided by our adjacent restaurant, featuring a tailored menu of mouthwatering contemporary American cuisine. Gallery Ballroom: Distinctive catering for our Chicago meeting rooms is provided by our adjacent restaurant, featuring a tailored menu of mouthwatering contemporary American cuisine.